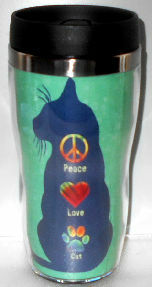 This cat travel mug says what we all want - peace, love and a cat. This is a stainless steel lined travel mug with a no leak slide-lock sip lid. The mug hold 16 fl oz. Keeps drinks hot or cold. The mug is 6 7/8" high x 2 1/2" across the bottom. Mug is boxed. Reduce disposable cup waste with your own travel mug.